While I love the time I spend in the mid 19th Century, with regard to my hair I’m a 21st Century woman through and through. My locks are short and chemically enhanced. It suits me. I refuse to grow my hair out so that I look unfortunate in my daily life so that I can create an appropriate impression in the mid 19th Century. For the last several years I’ve donned a longhaired wig in various colors (because I want to give Todd a variety of women to enjoy in one package- gotta love role playing! ); however, the darn thing is HOT -and not in the positive way. There is no way to feel comfortable wearing a full head of synthetic hair on a mid July day. So, I’ve tried 19th Century cross-dressing. My young man impression is quite good. My mechanic’s hat is fabulous; I’ve some spot on hand-sewn shirts with a dynamic cravat and vest courtesy of Kara Bartles. Todd helped me craft my braces. Past Patterns men’s summer trousers were easy to sew and fit beautifully. My footwear – not appropriate. Frankly, despite the corset and underpinnings, I am far more comfortable as a woman. In order to facilitate my newer role as a photographer, I can wear my black wool or silk dress, which should not reveal unfortunate contact with silver nitrate. My only nemesis – the hair. At Perryville a couple of friends suggested that I just use a braid to hide my modern crowning glory. But I search several sites and just didn’t want to pay $65 plus for a 36-inch braid. Naturally, the cheapskate in me caused me to conduct some research. If all else failed, I would succumb and purchase a braid from one of the purveyors of re-enactor hair. (several of which I consider good friends). There are some items I will not make myself – such as a corset. But hair – surely there was a more cost effective option. Ultimate, I found the solution on Amazon.com - my go to site for all things. 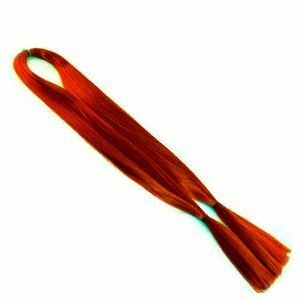 I found Silky Straight Kanekalon Braiding Extension Hair for $3.95 each piece. The pieces are 48 inches long and can be purchased in a variety of colors – both natural and unnatural. I found a color that worked well with my chemically enhanced modern hair. 3 pieces work well for a long braid that can be wrapped around your head. I bought a 4th to make a braided bun to attached to the back. The results is fabulous and the cost with shipping and handling-less than $20! Just a few hairpins and slicking back your bangs and you are good to go!